Book by Dr.rer.nat. Eberhard Wedler. Book by Dr.rer.nat. Eberhard Wedler, owner of Caoba. The name of the book is "Atlas de las plantas medicinales silvestres y cultivadas en la zona tropical" and was issued in 2013 after long years of research taking place in the Reserva Biologica Caoba. The region covered is from 0 to 1000 mts above the sea level. 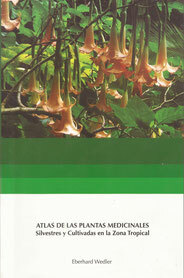 This is not a medicinal of pharmaceutical book, it is a book created for persons interested in botanic and nature. We have the book in the reserve if you are curious.